Welcome to Varonos Hotel! A traditional hotel wonderfully located in the heart of Delphi, over looking the famous olive valley and the Corintian gulf, close to every attraction! Feel the spirit of ancient years and the peacefulness of nature! Enjoy activities, wonder around the city, visit the sites and our shop with local traditional products! Our hospitality will surely make you feel at home! Check our Rooms and our Photo Gallery for more information on the provided accommodation. Our premium attic rooms with a wooden roof top will make your stay warm and cozy! 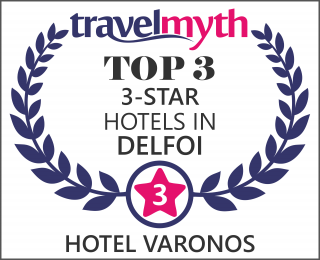 Use our Online Reservation system to get best available rates and offers for hotel-delphi.com! You can use our Contact form to communicate us and don’t forget to view our Guestbook! Hotel Varonos offers free internet access in the hotel lobby and free WiFi in the rooms!